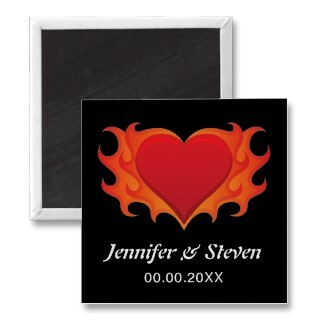 A modern personalized Save the Date magnet featuring a flaming heart symbolizing love and passion. Black background. Wedding date, bride’s and groom’s names are customizable. Click on the image for more details. Matching postage stamps, wedding invitations and other wedding stationery are also available. This entry was posted in Save the Date, Save the Date magnets, WEDDINGS and tagged Custom save the date magnets, Heart save the date magnets, Modern save the date magnets, Unique save the date magnets, Wedding save the date magnets. Bookmark the permalink.